The Lounging Hound Sofa Toppers are the perfect way to protect a new sofa, revamp a tired sofa and add colour and style to your living space! Whether you have sofa loving dogs, small children or an eye for interior design, a Sofa Topper ensures your sofa looks great and remains in perfect condition. 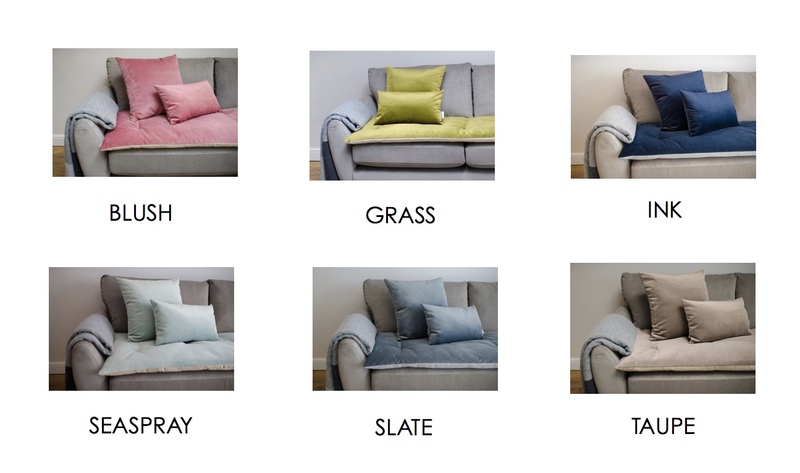 Handmade in the UK with a waterproof microsuede reverse and a luxurious double layer of filling and available in a range of contemporary wools and velvets. So give you sofa a break and let our Toppers do the work, whilst you relax in style! Sofa Toppers are made from stain resistant wool, and velvet fabrics designed to be both practical and durable. Most of the time, your Topper should simply require a soft hand brush or light vacum to keep it looking and feeling its best. Gentle cleaning with a damp sponge is effective for treating most stains or spills. Should your Sofa Topper require complete cleaning, it is machine washable on a gentle cycle with a light spin and dry flat or we recommend dry cleaning. Sofa Toppers are handmade to order and we require 14 working days to make up your product, prior to despatch. If you need to return or exchange an item please email us at returns@chelseadogs.com within 14 days of receiving your order stating your full name and contact details and your reason for return. You must return the item to us or our designer within 20 days in saleable condition and you are responsible for the cost and risk of return so please ensure you take out the correct postal insurance. In the case of an exchange of size, you will also have to pay the difference if there is any.